We recently got to spend a few days exploring a true gem in the US, the Florida Keys. We’d had it on our list for a very long time and had visited Miami multiple times, but despite it being so close, we never seemed to be able to make it there! 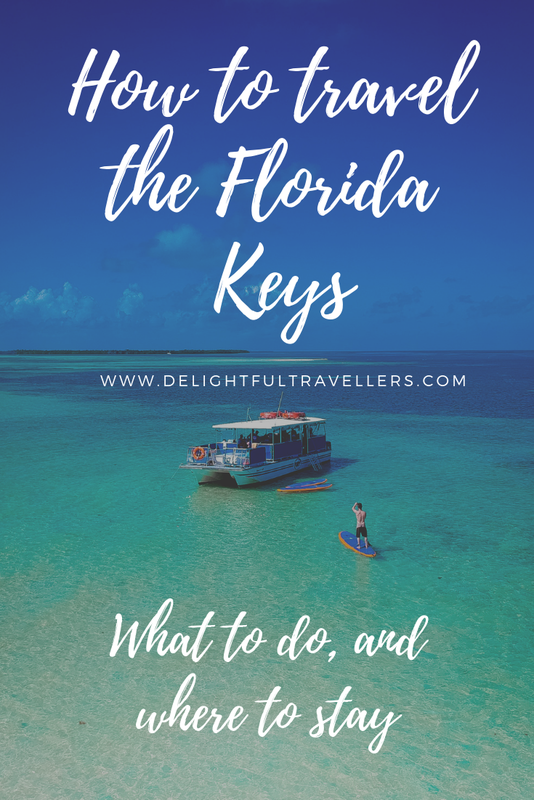 We spent five days and four nights discovering this incredible gem and have put together an itinerary for you of where to stay, what to eat and what to do while visiting the Florida Keys! We flew into Fort Lauderdale but depending on flights/prices, Miami would also be a great option. From here you can either arrange for a transfer or rent a car, both are great options but depend on how much you’d like to spend as well as how much flexibility you’d like to have. Whatever you decide, we’d highly recommend starting your trip from either of these locations as the drive to and through the Keys is stunningly beautiful and therefore we’d deem it as an essential part of your Keys experience. An abundance of palm trees in Islamorada. Starting off mid-day at the Fort Lauderdale Airport, we were quickly whisked off by our driver to make our way to Islamorada (a couple of hours by car). Situated about halfway down the Keys, the village of Islamorada is a great spot to base yourself for a couple of days. You’ll get the majority of the long driving done in the first day, thereby making all future day trips much quicker and more easily accessible. It’s also a great local village to explore and works as a fantastic introduction to the region with great restaurants, craft beer, and galleries. Amara Cay Resort from above. A gorgeous property with a lovely pool and waterfront, the hotel also has a beach bar and restaurant. A few of the rooms also have water views. This resort is perfect for couples and families. If you’re like us and prefer to have some downtime during your travels, this would be the perfect spot for it, with their zero entry pool and beach-frontage, both areas have an abundance of lounge chairs. For lunch we stopped At the Fish House in Key Largo. 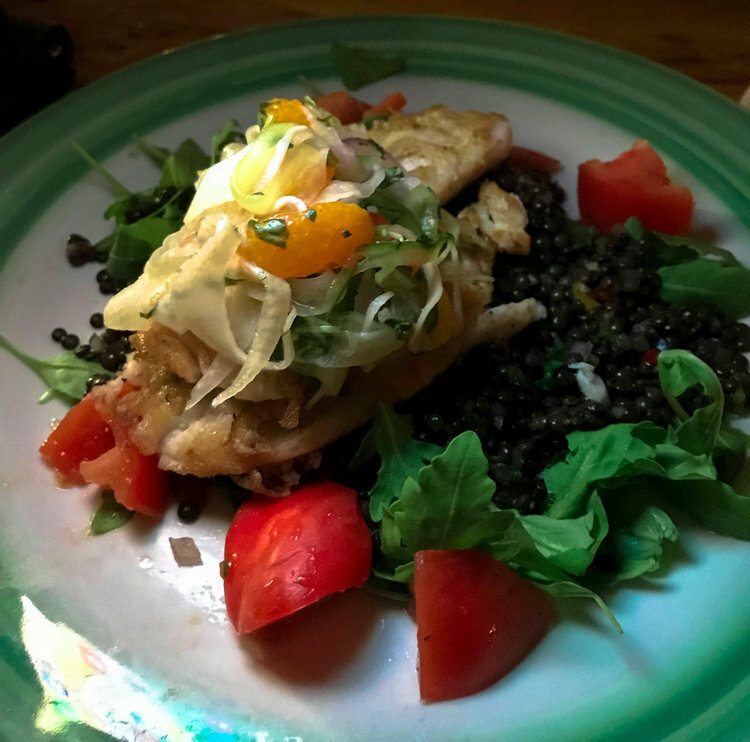 As the name suggests, they specialize in delicious fish dishes, to the point that you’ll almost be overwhelmed with the abundance of choices (in a good way)! Lots of different types of fish and sandwiches - you can essentially pick your type of fish and how you’d like to cooked/served. For dinner we visited Angler and Ale at Hawks Cay Resort. Although the inside of the restaurant looked fantastic we were seated outdoors where we could enjoy the lovely breeze from the water. The menu was varied with everything from various fish and seafoods to steaks and salads, here you’ll find something for everyone. Feeding tarpon at Robbie’s Marina. We departed our hotel early to make the most of the day, starting out at Robbie’s Marina to feed the Tarpon. This activity is not for the light of heart but if you can get over your fear it’s so worth it. The activity looks scarier than it is as these giant fish don’t actually have teeth! There’s also a fun little market here with lots of local vendors, so a great place to pick up some unique souvenirs. Visiting the turtles at the Turtle Hospital. Later we visited the Turtle Hospital, which was an eye opening experience and we’d highly recommend you visit for a tour. 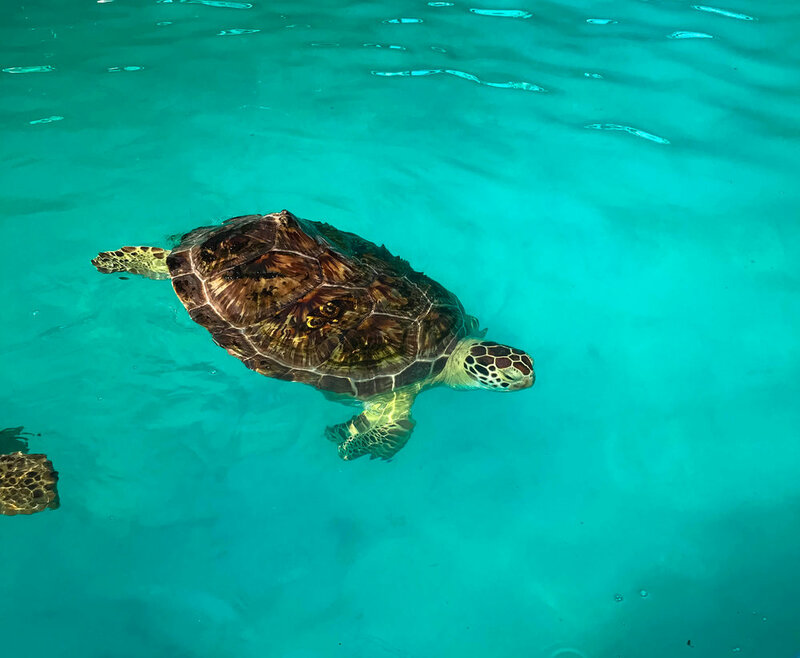 Rescued sea turtles are brought here for rehabilitation and if possible are released once recovered. Most turtles have either been injured by boats, or ingested a significant amount of plastic. Visiting here is a great reminder of the terrible impact we can have on wildlife, and you may learn a thing or two about things you can do help save our oceans. 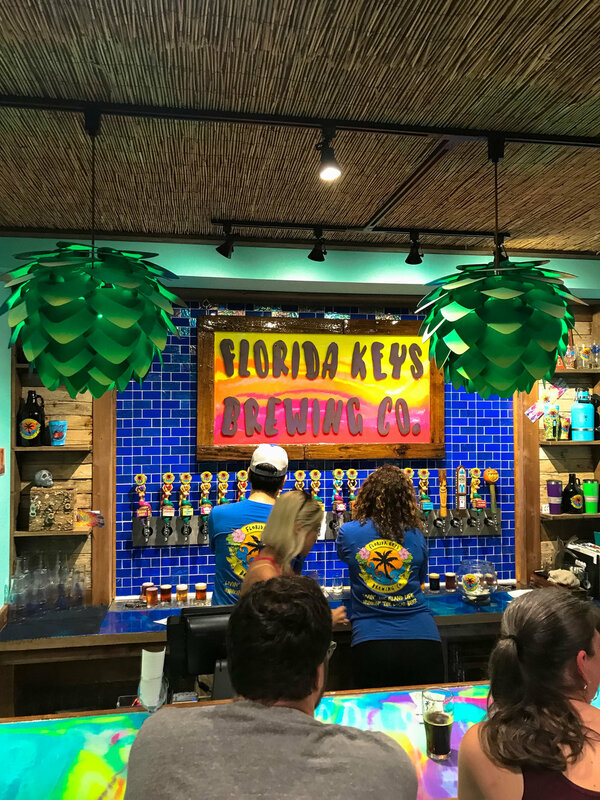 In the evening we went for a tour and tasting of Florida Keys Brewing Co. Craft beer tasting is completely up our alley and was definitely a highlight for us. Here they make a wide variety of different beers and styles and serve it in their very bright and uniquely decorated tasting room. The bar at Florida Keys Brewing Co.
We had breakfast at the Hungry Tarpon at Robbie’s Marina (where we fed the tarpon). They have a huge menu here and everything looks and sounds so amazing! From omelettes to lobster dishes, yogurt to burritos, there is definitely something for everyone. We figured it would take awhile for our food so we ordered first and then went and fed the tarpon while we waited for our food. We had lunch at Keys Fisheries which you’ll find very close to the Turtle Hospital. Order at a window and be sure to leave a funny name for them to call out when your order is up (“Donald Duck- your order is ready”). Although mainly fried food you can also find a few salads, mac and cheese, etc. Dinner at Morada Bay Beach Cafe. Dinner that evening ended up being one of our favourites at Morada Bay Beach Cafe. You’ll find it right in the main area of Islamorada, almost directly across from the brewery. This restaurant has a beachy chic vibe with a cute airstream boutique to browse while you want for your food. Like most places in the Keys they do have an abundance of fresh seafood dishes but we also enjoyed a chicken curry as well as mac and cheese so this restaurant definitely has something for every type of eater. The Floriday Keys from above, as seen from Bahia Honda State Park. After spending two nights in Islamorada at Amara Cay Resort, on our third day we checked out first thing in the morning to make our way further down the Keys to the famous town of Key West. However, if you have a similar itinerary, be sure to stop at Bahia Honda State Park. Here you can swim in the Gulf of Mexico and then walk about 50 feet and swim in the Atlantic Ocean. You’ll also find a very old and no longer used rail bridge, great for photographing. The old train bridge at Bahia Honda State Park. After stopping for lunch (more on that soon) we made our way to Key West. Once we checked into our hotel we made our way to Mallory Square to catch the sunset Celebration. Key West (as the name suggests) faces West which makes for an incredible sunset. Each night the waterfront is packed with spectators and performers but the festivities feel as though they come to a momentary standstill as everyone crowds around to watch the sun dip below the horizon. The perfect sunset at Mallory Square, downtown Key West. The pool at 24 North Hotel, Key West. Just on the outskirts of town you’ll find 24 North Hotel. Although not in the downtown area of Key West they very conveniently have a regular (and free) shuttle bus to take you back and forth. But if you are in the mood to just chill you’ll find an absolutely gorgeous pool along with a bar/restaurant in the back. On our way to Key West we made our way a bit off the beaten path (make sure you have good directions) to No Name Pub on Big Pine Key. No Name Pub is famous for two things! The first is the dollar bills that completely cover every single wall and ceiling space on the entire premises, it’s estimated that there are millions, which definitely makes for interesting decor! 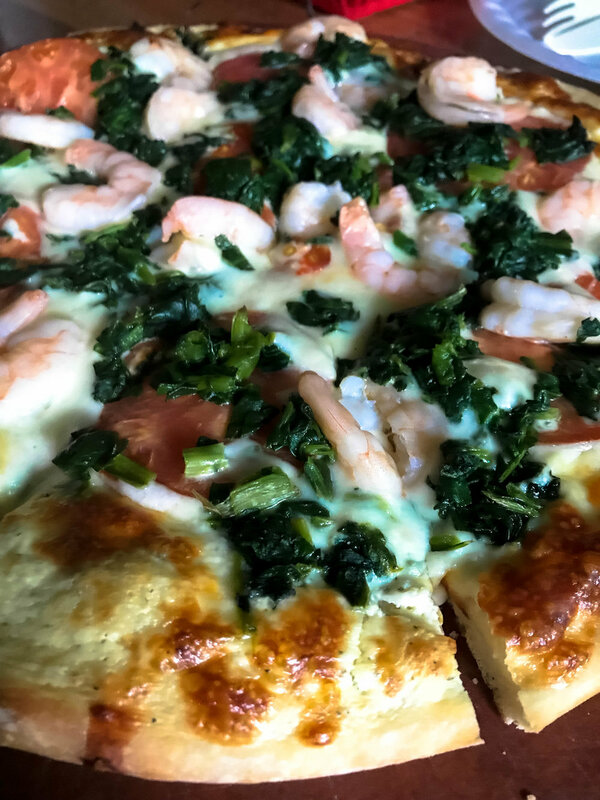 And the second thing is the shrimp pizza. Also be sure to look out for the tiny deer that are native to this island! In the evening we had dinner at Turtle Kraals. As the name suggests they do in fact have turtle races here, but unfortunately we missed out! We sat up on their rooftop patio to enjoy a nice evening breeze while we dined on more fish, tacos, and sandwiches etc. (like many of the other places we visited, they had a varied menu with options for everyone). The next day we were up and out of our hotel bright and early for what ended up being one of our favourite activities during our time in the Keys. We boarded a boat with Fury Water Adventures for their Adventure Eco Tour. Both breakfast (pastries, coffee, yogurt, etc) and lunch (fried chicken, sandwiches, salads) as well as drinks (beer, water, soft drinks) were provided during the tour. As we chowed down on breakfast we made our way away from Key West for about 45 minutes- our first stop was some amazing snorkelling with an abundance of bright, tropical fish! After spending a while floating, swimming and admiring the fish we made our way to much shallower area with mangroves and sandbars. Here we went kayaking through the mangroves as we learned about the interesting history of the area. Because we were doing really well for time our captain offered to take us to an area known for dolphin sightings before we were to head back. This certainly didn’t disappoint! As soon as the boat slowed we quickly spotted a pod of dolphins that spent quite a while circling and playing with the boat. In the afternoon we had time to explore Old Town Key West. We set off from the rest of our group to explore the streets and the unique architecture that has both a Southern and Caribbean influence. Along the way we visited the Southernmost point of the Continental U.S. (we didn’t wait in the long line for a photo). We also spent some time at the historical home of Ernest Hemingway. Hemingway lived here from 1931 to 39 and you’ll still find many descendants of his own cats roaming around the property. We didn’t take the tour but did wander through the various rooms and outside of this beautiful home. 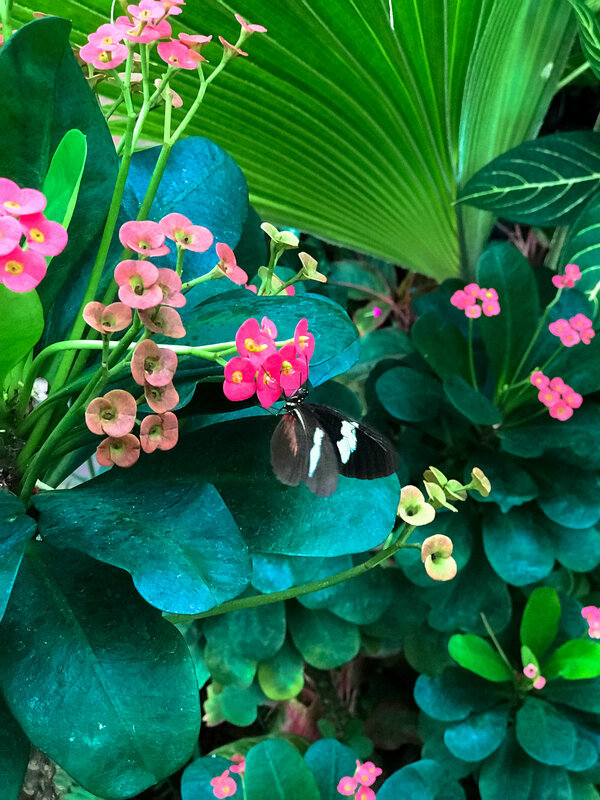 Our last stop of the day was the Key West Butterfly and Nature Conservatory. We weren’t sure what to expect before we entered but what we found was a tranquil indoor garden filled with plants, streams, birds and so many different types of butterflies you’d never be able to keep count. Spotting butterflies at the Key West Butterfly and Nature Conservatory. Kermit’s Key West: You definitely can’t miss the brightly green facade of this store in downtown Key West. Kermit’s specializes in all things Key Lime Pie, from the pie itself to dog treats to oils, be sure to go in a taste test as much as you can! You can also get Key Lime Pie on a stick and chocolate covered! We ate a lot of Key Lime Pie on this visit (a story for another time), and the pie at Kermit’s definitely held up in the competition! They also have a small cafe next door if you’re wanting something a bit more savoury. In the evening we ate at the newly opened (and super chic) Perry Hotel at their restaurant called Matt’s Stock Island Kitchen and Bar. The menu definitely compliments the modern and sophisticated surroundings. 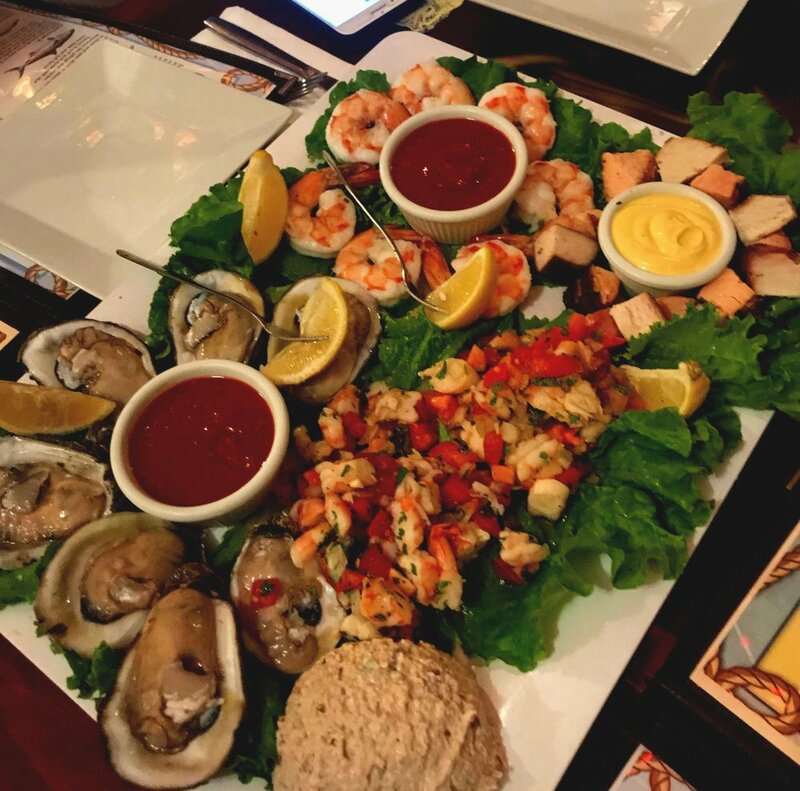 We started off with seafood platters to share and later dined on various dishes including fish, salads, fried green tomatoes and corn bread! It was the perfect way spend our final night in the Keys. Dinner at Matt’s Stock Island. With only a few additional hours to spend in the Keys, we checked out of our hotel with one last stop before flying out. We hit up Blue Heaven in Old Town Key West for breakfast. This was the perfect last stop in Key West and you definitely don’t want to miss it, but keep in mind the line ups can get quite long so come early! Like so many of the other establishments we visited on our trip, this restaurant also had a vast and delectable array of dishes, making it nearly impossible to decide! 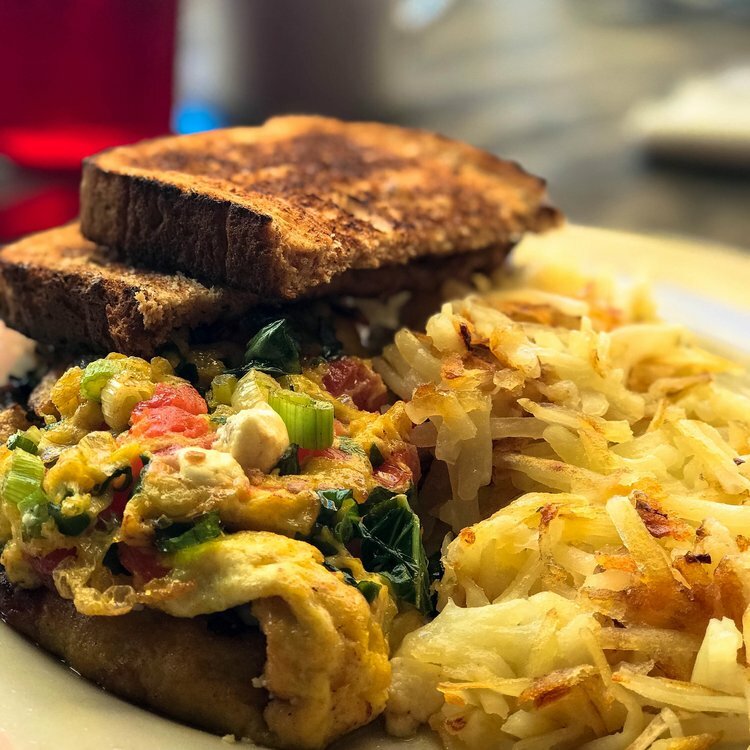 From pancakes to lobster and grits to design your own omelette, based on everything you tried, you can’t get disappointed. Being our last meal of the trip we had to finish off our meal with the most scrumptious Key Lime pie that had the biggest meringue topping you could possibly imagine. 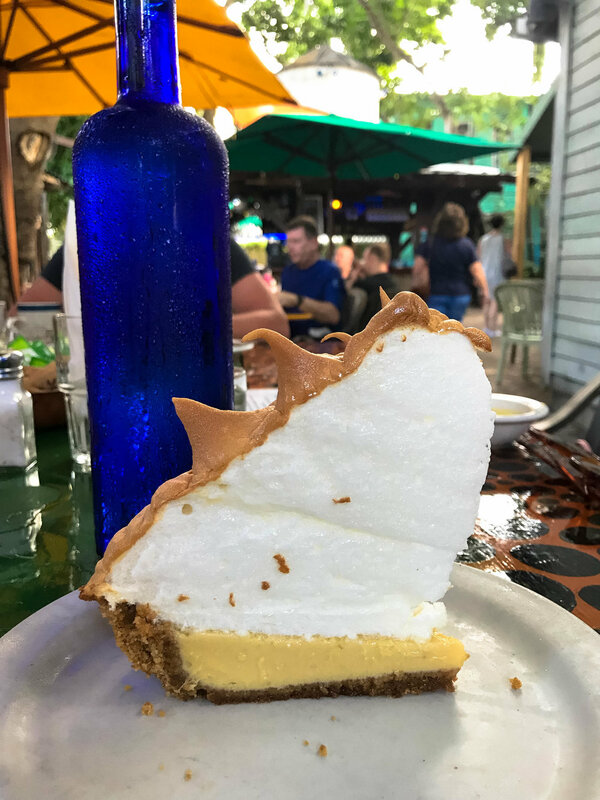 Our very last piece of Key LIme Pie while visiting the Florida Keys. After breakfast we made our way to the small airport in Key West to fly home! We found flying into Fort Lauderdale (or Miami), making our way through the Keys to fly out of Key West the perfect way to do this trip. With a focus on Islamorada and Key West, stopping in between we really felt like we were able to get a good feel for the area and see and visit a wide variety of places and things. Finding cute blue themes in Downtown Key West. Lastly, we met so many incredible people along the way and were both surprised and impressed with the incredible commitment to the community as well as the environment that seems to be ingrained in the community members. You’ll find a huge emphasis on buying local, supporting community members, and doing everything possible to help with the environment (good luck finding a plastic straw). We left the Keys feeling both excited and inspired by the incredible dedication and work we found taking place in this very unique place in the world! For more information about the Florida Keys visit fla-keys.com.